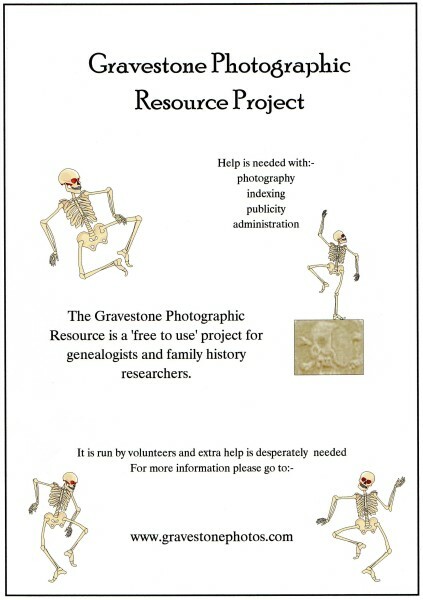 The gravestone photographic resource project is an attempt to provide a much needed on-line genealogical resource for family historians. It is a private initiative to collect and publish photographs of gravestones or monuments on an international basis Further details can be found on their web site at www.gravestonephotos.com The site was developed by Charles Sale, and is run in his own time at his own expense Some of the costs are defrayed by Google advertising, and he is assisted by a pool of volunteers You can find out more about helping this project at the volunteers page. So that the site is responsive, images are kept small (thumbnails), but once an image is identified as one that you want you can request a larger size. An example is this image of my aunt's grave; Olive Hills' grave monument (external link to www.gravestonephotos.com). I was able to download a 960x1280 higher resolution image of which this is a small crop. Note that although images may be used for your own research purposes, copyright remains with the Gravestone Photos Project and publication is only allowed in the prescribed manner. Please help support this project If you find the site useful, pass the link on to your genealogy friends.